United States’ national parks are renowned as some of the most exceptional landscapes in North America. Travelers come from all over the world to visit big names like Grand Canyon, Yosemite, and Yellowstone, but the 61 national parks are just a fraction of public lands with federal protection. The park system's two busiest units, Golden Gate National Recreation Area and the Blue Ridge Parkway, aren't national parks at all. The country is dotted with national monuments, recreation areas, historic parks, battlefields, seashores, lakeshores, rivers, grasslands, and more. The different designations come with varying levels of protection and regulations unique to the environment or historic site they encompass. Though national parks are may be the cream of the crop, all the national park units have their own merits, and they offer plenty to do outside even though they aren't technically national parks. Here are some of our favorite national park units for outdoor adventures. Overlooking Mount Adams and the Mount St. Helens crater from its summit. Shane Kucera. Mount St. Helens is not, strictly speaking, a National Park Service unit. 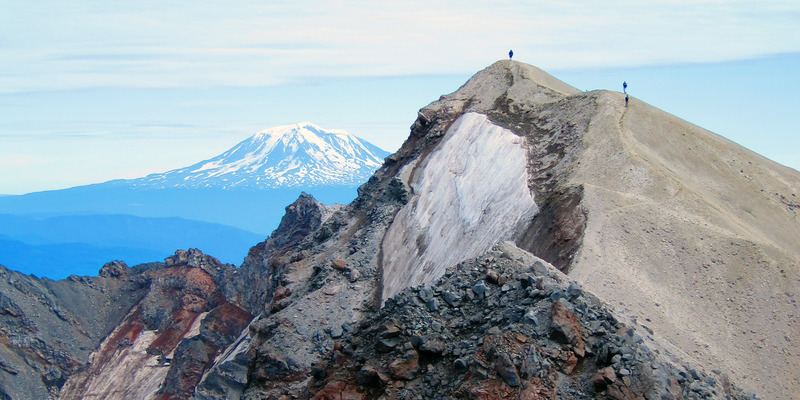 It's managed by the U.S. Forest Service, the first time the Forest Service has managed such a landscape, and Mount St. Helens is easily the most recognizable North American landscape to dodge national park status. Debate about changing its status has simmered since the 2000s, when budget cuts forced the Forest Service to close one of the monument's visitor centers. We love the idea of the federal funding that comes with a national park—especially in light of that mining proposal in the Helens area. But in the meantime, Mount St. Helens occupies a beautifully ambiguous status among federal lands. Its iconic history hasn't changed, either. Mount St. Helens erupted catastrophically in 1980, blowing out part of the mountainside, devastating nearby towns, and leveling surrounding forests. Today, the trees are regenerating and the mountain is coming back to life. Though the crater still steams and smokes, the nation’s only expanding glacier is forming on the inside, and vegetation is returning to lower mountain slopes. The national monument preserves this ancient yet ever-changing landscape, standing as both a memorial to the disaster and a testament to nature's resilience. There are many ways to experience and learn about the volcano. From a roadside stop, you can view the blast zone and stare into the fuming caldera. Day hikes explore the young forest, lakes, and rivers at the mountain’s flanks. Some trails descend into lava caves and narrow rifts in the earth. Backcountry camping is limited in order to protect the sensitive environment, but it is allowed in a few designated areas. 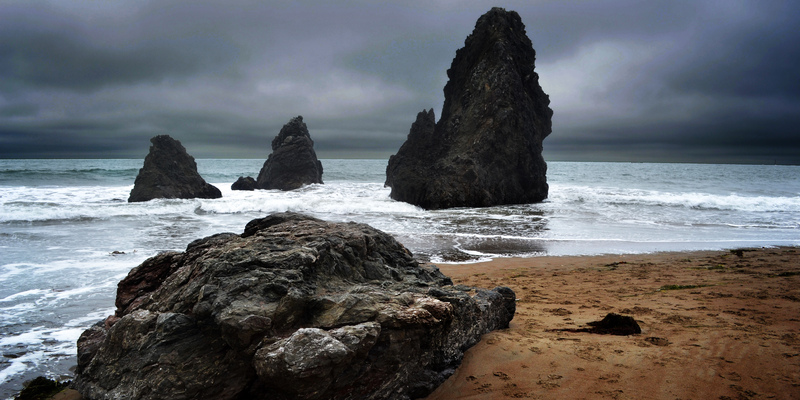 Moody skies and sea stacks at Rodeo Beach in Golden Gate NRA. Matt Hanson. The Golden Gate Bridge connects downtown San Francisco with the vast rolling hills of Marin Headlands. The iconic bridge is one destination all its own, but it is also an avenue to nature from the city. The recreation area covers coastal hills, sea cliffs, and sandy coves that are mostly spared from urban development despite their proximity to the metro area. The Marin Peninsula was fortified for defense during past wars, but with the bunkers now abandoned, chaparral and grassland are reclaiming their place. Many miles of trails undulate through the terrain, climbing to panoramic summits and descending to sheltered beaches. There are paths for hiking, biking, and horseback riding. Beaches, viewpoints, and historic sites are numerous; some are roadside, but most are reached by trail. Next to Golden Gate NRA is Muir Woods National Monument, a bastion of the redwood forest which once covered much of the Bay Area before logging and urban expansion. Coastal redwoods are some of the tallest trees in the world, and in Muir Woods you can see specimens that are nearly 250 feet tall. Trails in Muir Woods connect to many others in Golden Gate NRA and Mount Tamalpais State Park. Chapel Rock during the colorful fall turn on the Lakeshore-North Country Trail. Aaron Shady. 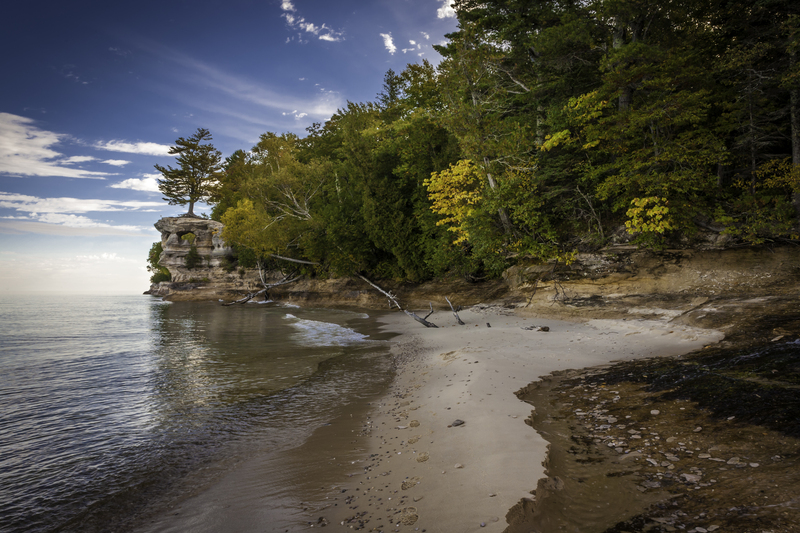 On Michigan's Upper Peninsula, the waves of Lake Superior have battered stone cliffs into fantastic formations, deposited sandy beaches, and created one of the most unique landscapes in the Northwoods. Dense trees overhang the bluffs along Lake Superior, and creeks tumble down to meet the lake. The forest lights up with wildflowers in spring and summer, blaze with color in fall, and soften with snow in winter. Along this lakeshore you can find natural rock arches and towers, numerous tall waterfalls, swimming holes, inland lakes, quiet campsites, and nearly 100 miles of trails. Most visitors come in the warmer months or in the fall to hike among the foliage, but winter holds many opportunities for snowy adventures. Snowshoeing, cross-country skiing, ice climbing, camping, and ice fishing are all available after winter sets in. The rugged and desolate terrain of Reflection Canyon. Kathleen Buenviaje. 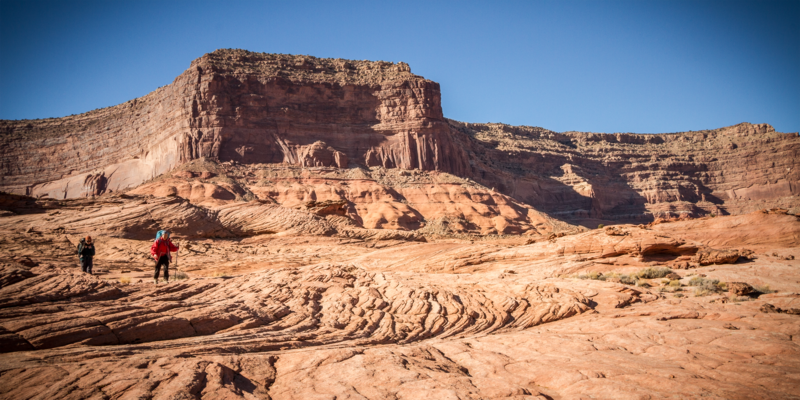 Covering much of Southern Utah is a vast labyrinth of serpentine canyons and precipitous cliffs. When water falls on this desert landscape, it funnels through mazes of erodible sandstones to deeper and deeper canyons. Much of it comes to rest in Lake Powell behind a dam within a great gorge of the Colorado River. Combined with water that’s flowed all the way from the Rocky Mountains, the desert channels create a giant pool of blue among sunset-colored cliffs. The setting is a novelty, to be sure, and not at all what nature intended, but the aesthetic is unrivaled, and the reservoir provides a way to reach corners of the canyon country that would be hardly accessible otherwise. Rainbow Bridge is one such destination that you can approach by water. On the edge of the reservoir’s recreation area is this tiny national monument that preserves a natural bridge of stone. From a finger of the lake you can hike a desert wash to reach the formation. Aside from Rainbow Bridge, there are countless other arms of Lake Powell that are less frequently traveled. In fact, the reservoir's extent is so great, and side canyons so numerous, that some are seldom seen. On Lake Powell you can paddle in twisting slot canyons, camp in sandy coves, and hike to proud viewpoints high above. You can sunbathe and swim for half a day, or disappear into the wilderness for a week, whatever suits you. 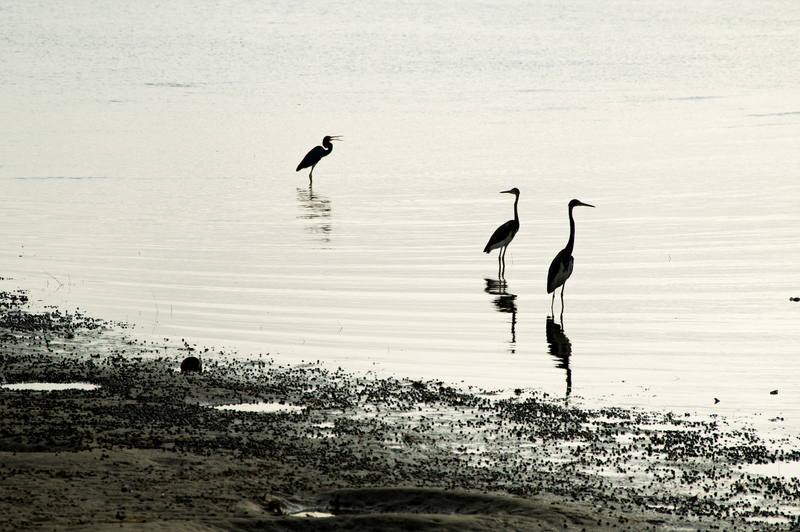 Herons fishing in the waters of the Shackleford Banks. Jesse Weber. Cape Lookout and Cape Hatteras are two separate but neighboring national seashores in North Carolina, both with excellent island recreation. Cape Lookout is the more remote of the two because its islands are only reachable by ferry, whereas Cape Hatteras has bridges from the mainland. Both seashores encompass chains of barrier islands in the Outer Banks, which are famous for their pristine sandy beaches, fishing, lighthouses, colonial history, and relative isolation. Some of the islands are more than 15 miles from the mainland. Parts are very popular, but others are seldom visited. Both of these national seashores are havens for wildlife and retreats for seekers of solitude. On some islands you can encounter wild horses, descendants of released or escaped animals in colonial times. Most of the islands are great for birdwatching, dolphin spotting, and sea turtle nesting. You can find vast, undeveloped stretches of shore with isolated beach camping, paddling, and hiking opportunities. With more than 400 total areas managed by the National Park Service, narrowing down to just five misses out on a plethora of other opportunities across the country. Here are six honorable mentions that could have easily made the list. Check them out and maybe one of these could make your next outdoor adventure.